Twenty-six fire hydrants in the Village of Carlsbad have been “adopted” by businesses and individuals, with a major portion of the “adoption fee” going to benefit the Injured Marines Semper Fi Fund at Camp Pendleton. The art project was organized by the Chamber of Commerce, in cooperation with the City of Carlsbad, to promote art, activity and community involvement in this seaside downtown area. Each hydrant has been uniquely hand-painted by local artists, students, residents and business people, who donated their time and talent. The art materials were donated by Tru-Value Hardware Store in the Village. 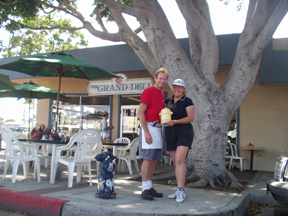 The fire hydrant art reflects the many faces and facets of Carlsbad – the heritage, location and lifestyle. The Animal House Pet Care fire hydrant, #13 on the tour, titled “Animal House” is located on the sidewalk outside Mike Downs's Grand Deli on the corner of Roosevelt and Grand, where many dog lovers enjoy breakfast or lunch with their pets by their sides. 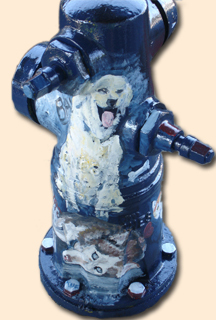 Artist Marla Epstein created a delightful scene on the hydrant with dogs and cats under a starry sky, including Animal House Pet Care owner Susan McBride's Siberian Husky “Jazmine” and several of her “clients”. Epstein, well-known for her pet portraits, is owner of Ginger Grayham Fine Arts Gallery located two doors down from Grand Deli…and the fire hydrant. Visitors to the Carlsbad Chamber of Commerce website www.carlsbad.org can take a virtual tour of the fire hydrants. 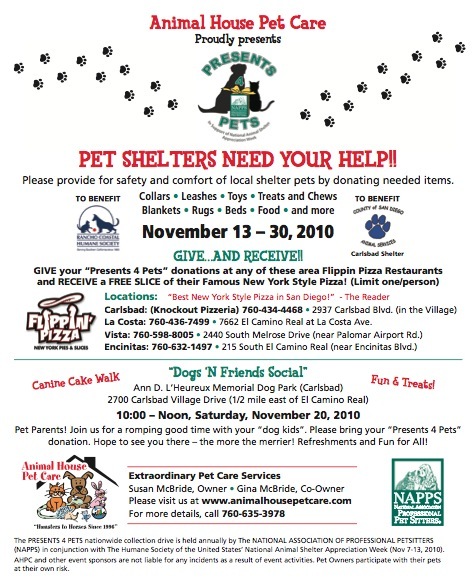 Brochures with a map showing locations of all the fire hydrants are also available to download from the site or to pick up at various businesses in the Village, including the Carlsbad Convention and Visitor's Bureau. Take a stroll through the Village of Carlsbad and enjoy this unique community art event.